I won't disagree with you on many points... which is why I discourage folks from trying to have bluebirds in their boxes IF there are lots of HOSP around and IF they are not willing to help the bluebirds. And if there are... yes, it's a gruesome chore and one which I tired of so completely that I stopped putting boxes out. But in areas where the two species are in competition, the HOSP win unless they themselves have human enemies. It's an endless struggle though, being a bluebird ally in areas with too many house sparrows. Ironically, the suburban yards and buildings now dominated by house sparrows was once a favored habitat of bluebirds, before the arrival of the house sparrows, that is. That's often the problem with non-native species - they take over habitats formerly occupied by native species. In this case, bluebirds were once very common in suburban areas living in close proximity to humans. After house sparrows were introduced, they were nearly driven to extinction in much of their former range. As far as nest placement for bluebirds - they like big yards with few trees and lots of short grass. They make a living by perching on low branches, roofs, posts, wires, etc. and watching the grass for insects. When they see one, they fly down and grab it. If you have a large yard, put a nest on a post between 5 and 8 feet off the ground, with the hole facing north, and if there are any bluebirds around, they'll check it out. It's best to have the box about 50 feet from other trees and shrubs as the house sparrows and starlings will use those other trees to launch attacks on the nest. 50 feet gives the male more time to repel them. Years back, around this time of year, I was putting a wide-board pine floor down in a spare room at our old house. I was at the saw and peeked out the picture window to see a male and female pair of bluebirds perched on the corner of a detached garage and screen room in the backyard. After lunch, I got some pine cutoffs and quick cobbled together a nesting box, then took it out and mounted it just under the roof overhang on the screen room. Swear to god, within a half hour, the bluebirds were checking it out and within an hour after that, the female was inside while the male brought her grass and stuff to build a nest. That started a three or four year period of having bluebirds nesting in my yard. One season, they raised two broods, so, by the winter, there was a family of 11 bluebirds in my yard. I had helped them when they raised their young by putting out live mealworms in an empty catfood tin I mounted to the top of a piece of broom stick stuck in the ground. Every time I brought worms out, I whistled the same two-note call, kind of like the call a peewee makes. By the end of the summer, I could walk down the street a few houses, whistle, and within a minute or so, a bluebird would land on the wire overhead to see if I had food. As enchanting as they are, I discourage anybody thinking of having bluebirds nesting in their boxes UNLESS they are fully prepared to ruthlessly destroy any House Sparrows (HOSP) that try to take the nest over... and if there are lots of House Sparrows, you're going to be very busy indeed as they will constantly harass the bluebirds. If the HOSP gain entry into a nest with a mother sitting on eggs, they will peck her to death unless she flees and they will destroy the eggs. If they gain entry into a nest with baby bluebirds, they will kill them and build their own nests right on top of the dead babies. In the few years I had nesting bluebirds, I killed over 100 HOSP, by shooting with a pellet rifle, or by trapping them with false nesting boxes I'd tape to the front of the real boxes they had driven the bluebirds out of. This is perfectly legal to kill them in CT, as HOSP are invasive aliens that have done a lot of damage to many native songbirds, especially bluebirds. But if you're not willing to protect the native songbirds in your nesting boxes from these house sparrows, you won't be doing them any favors by allowing more HOSPs to breed. Besides a Greenie or a Z, what is your favorite old reel? no love for the Alcedo Micron? My avatar photo was taken just downstream from the Rt. 190 bridge crossing the CT river from Enfield to Suffield. 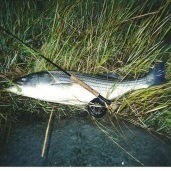 They was in May, from 1992 or 1993 and we were catching stripers to 25 pounds on topwater plugs as far upriver as the Holyoke Dam. I have no idea what it's like now.. but back then there were only maybe 10 of us in all, and we had the whole stretch from Windsor Locks to Enfield dam to ourselves.... good times. Stripers blitzing herring all over the place and not another fisherman in sight because the shad run was over. A few summers back I spent a bit of time rowing my skiff around Aspinook Pond in Lisbon taking photos of the flowers blooming along the shores. I just came across the folder on my desktop that I'd tucked the files into. From a few summers back - I just found them on my PC. Here's one I took a few years back. I had a rowboat backed into the thickets growing on the shore of Aspinook Pond so's I could take photos of the wildflowers in there. This catbird watched me for a bit, hoping I'd uncover something to eat, most likely - as is their wont. Store-bought Gee vs making clarified butter? Ghee is easy to make at home but it's a bit tedious. IMO, it's worthwhile to use very high quality butter, grass fed, organic... You also have to stand over it watching it closely so it doesn't scorch. I like it for Indian dishes as it has a pretty high smoking point when tempering spices and it lends a nice texture and flavor to dals. If you make it correctly, my experience is that it will keep at room temperatures for a couple of months, opening and closing it as needed. In the fridge, even longer.